Microsoft’s operating system that once dominated sales with no clear competition in sight is now in the position of the underdog as Google’s Android and Apple’s iOS devices are each outselling Windows-based products, according to the latest Goldman Sachs analysis. And that’s not a huge surprise as smartphones and tablets are getting in everyone’s pockets. The share of Windows PCs has dropped to 29% of all Internet-connected devices, while smartphones and tablets grab a dominating 66%. "The compute landscape has undergone a dramatic transformation over the last decade with consumers responsible for the massive market realignment. While PCs were the primary Internet connected device in 2000 (139mn shipped that year), today they represent just 29% of all Internet connected devices (1.2bn devices to ship in 2012), while smartphones and tablets comprise 66% of the total. Further, although Microsoft was the leading OS provider for compute devices in 2000 at 97% share, today the consumer compute market (1.07bn devices) is led by Android at 42% share, followed by Apple at 24%, Microsoft at 20% and other vendors at 14%," Goldman Sachs claims. More than that, Microsoft is facing an “uphill battle,” even if it wants to regain its share. The trend emerged earlier and bore fruits in Q4 2010 when smartphones and tablets started outselling PCs for the first time. Goldman Sachs has some interesting but somewhat strange estimates about how the market will evolve in the next few years, claiming that Android’s market share will actually begin to dwindle, while Apple and Microsoft will grow their markets. That is obviously not happening right now, actually the opposite is true - Android is rapidly expanding its reach, so it would be interesting to see how that plays out. With 1.3 million daily activations and with an installed base of over 480 million, Android alone is expected to outgrow Windows’ installed base over the next couple of years. To reverse that trend Microsoft will really need some breakaway hit with a tablet like the Surface, but could that really happen? Let us know your thoughts in the comments below. Mobile is the present & future.it will be better if MS puts Windows 8 instead of Windows phone 8 on mobile devices.They will gain their lost market share & remain dominant forever. 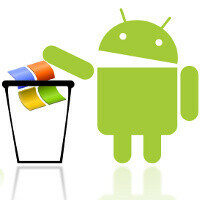 I see a different future: Android in PC and open source software will rule. MS and Apple will be marginalized. You mean Linux? Linux is hugely important as w/o it there is no Android. Linux and other open source software could not rule but it forced MS to loosen its deadly grip: consumers see more value for money and MS had to innovate more. The reason open source cannot win PC war is the lack of a viable ecosystem, but with Android it's very different. i mean linux desktop o.s.es, linux itself is just the kernel. i mean ubuntu and all that other jibberish, what percentage of the market do they or have they ever owned?? Ogy what were you saying about Windows the other day? Hahahahaha... It's just a matter of time bud. The flop that is Windows 8 isn't going to change a thing. No, mostly because Microsoft entities such as CEO Steve Balmer keep trash talking the competition (Android&Apple), claiming that their products are better, more advanced, and easier to use-- not really, it actually makes them look weak, desperate even. Microsoft to me has sucked as of late, only thing I use from Them is Windows for my laptop. The live tiles widgets looks stupid and isn't even original because they're getting sued for the patent by some random company. In addition, no flash support, they won't allow manufacturers to put more than dual-core processors in the phones, my guess, too expensive. Also, the manufacturers have to pay Microsoft a fee so they can sell phones, tablets, etc for their platform. Before I forget, anyone heard of the lack of internal space in the surface tablets? Just about half of the memory is already filled with the apps and files from Microsoft, which almost defeats the purpose of paying for 32 GB of internal storage when 16-17 GB is already being used. You can use a flash drive, but seriously, come on... That defeats the purpose of paying for more memory in the first place right off the bat. It's the principle folks, not everyone is stupid, and while we can afford to buy these fancy toys, it's always best to know exactly what you're paying for and if you get the best of your honest buck. Am I alone on this one? Nah, I don't think Ballmer's trash talk would affect sales. People who are concerned with this ongoing OS crusade are a miniscule part of their consumer base. There are other mistakes that are costing MS which I think are: - Late entry to mobile segment - Current lack of ecosystem - Rushed launch of WP7.5, which left many basic functionality - Steep priced surface tabs I am also very optimistic about WP8 and the future of MS. Let's give it time and see how good it does. Time is all an Ecosystem takes to mature. Who's to say by the time the ecosystem does mature if it'd be too late? The other platforms are more developed and have taken time to.mature. Android started small, so I guess it could work. Even so, I'm sticking with Android, it's fun, easy to use, and most of the good stuff is rather cheap, but very high end. I prefer the Samsung brand. So do you imply that 1 million apps should be added to WP today? Apps aren't the only important things to consider, it's the user experience that dictates whether a platform is good or not. What good would 1 million apps be if.they didn't work right? not alone but most are not as considerate of the memory. Most are concerned with it running the things they accomplish daily. Techies aside, regular people not us just want something to work that does not take long to use and provides access to everything. That is why smartphones have gained success. Most regular people are not clamoring for 64GB on their mobile devices because many do not utilize more than 16GB at best. open source wins.....thank you for the freedom!!! finally! Android is open source dude, but Google apps, Android SDK are not. B-c Android is open source Amazon could use it and make Kindle Fire. Android not open source? You're kidding right? Where have you been living ? What I stated before stays only for Honeycomb! Yeah, about 1 ~ 2% of Android And you couldn't say it before because....? MS should have priced the surface competitively. I like the concept of the surface but it should also lead in the price as well. the surface will never lead in price as android will always be able to undercutt it. At best they could undercutt Apple but not android as its just too affordable in that right. What is Atari Amiga and that before the windows?? They all were OSes that competed with Windows and lost. As you can see Windows was not the first at all.